"I can't believe what we achieved in just two weeks. I learnt so much and can't wait for the next production!" 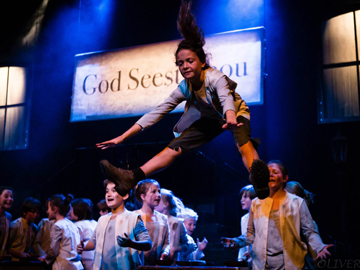 Our Stage Experiences are open to performers of all experience levels, age range 8 to 25 years (depending on the production). Professional production standards and a highly experienced and effective team ensure we get the very best from our performers and create high quality shows. Rehearsals are intensive and hard work but also great fun and there are opportunties to make new friends as well as gain experience in acting, singng and dancing. If you are not a performer but still want to be involved you can work behind the scenes with a variety of roles available from costume, hair and makeup to props, sound and lighting.